Me name be Bartholomew Roberts. 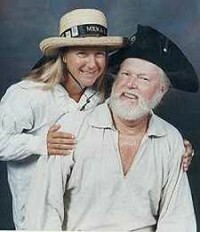 Me division aboard the Armed Privateer MEKA II be purser/clerk and scribe fer th’ captain. I be a parrorate. 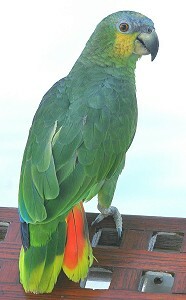 Now that be a parrot-pyrate t’ those less informed. Me friends call me Black Bart fer short or even shorter, just Bart. I stand about 15 inches stall an’ weigh equally to four gunpowder charges o’ th’ bow gun. Which be equatin’ t’ about 1 pound. I be green hence the Black Bart, Har! Har! So be it. Enough o’ this cockney bilge. I be far more educated and believe me I have had the time. I was aboard the Royal Fortune commanded by the great pirate Bartholomew Roberts. 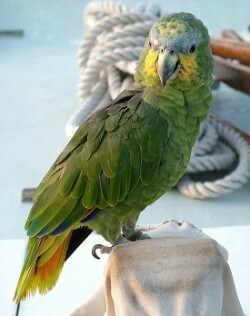 We were anchored off Parrot Island on the Guinea Coast and I was blessed with talk and understood the King’s English. Nighttime rolled around and one of the ships had taken off in pursuit of a sail spotted on the horizon during the afternoon. So, the captain being at his leisure, I offered a fine toast of good rum in anticipation of our colleagues returning with a rich prize pushing our holds to the max. Now you have to understand that Captain Roberts was a teetotaler, a complete abstainer of alcoholic drink. In fact, I have only known him to consume spirits one other time. I was taken aback by this turn of events to my offering to say the least but I was pleased. The captain poured a round and I began regaling him with tales before I joined the Royal Fortune. By morning we were both into our cups but still able to enjoy breakfast, the Captain’s solomongundy and a fresh dish of sunflower seeds for me. The drunken lookout and crew shouted that a King’s ship was upon us. She was the Swallow, Captain Chaloner Ogle in command. We slipped our cable in the most unseamanlike fashion the crew being so inebriated. Our resistance was bleak with the Captain being hit in the throat by grapeshot, one of the shot carrying away my larboard (port today) wing. Captain Roberts died almost instantly and the crew were easily killed or captured. I was spared and patched up. Captain Roberts was buried overboard in all of his finery. While convalescing I had the most astonishing dream. There were all these pirates around my perch where I clung to life in a fever. I couldn’t tell exactly what they were saying but it was in many languages and they seemed to agree on one thing involving me. Finally one large bearded fellow stood forward and spoke. He said that it was my fault for enticing the great Bartholomew Roberts with drink and the rest of the crew following suit. I tried to speak in my defense but could not utter a word. It was as though my tongue would no longer form the words. I was told that a curse had fallen upon me for my betrayal to Captain Roberts. I would no longer be able speak the King’s language and would live forever recounting this day in shame. Along with the curse came two gifts. One was, even though I could no longer speak, I could write. I had plenty of quills on my starboard wing. All I needed was ink. The other was that I now carried the power of the Black Spot. That would do me no good because it had to be handed out by a legitimate sea captain. The lone pirate told me something about redemption but I was so sick at heart and body that I didn’t understand his tack. All this was on the 10th of February 1722. The years went by and I didn’t die. I was invincible and sailed with just about every known pirate through the years keeping my own council like all parrots do. 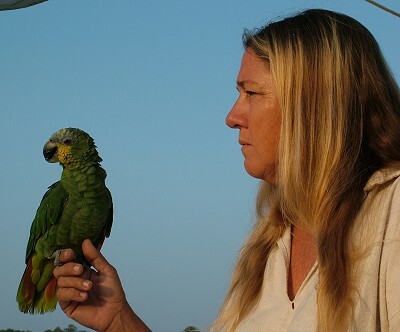 Many a parrot friend joined Davy Jones locker but I sailed on never uttering a word again although I learned to understand 37 parrot dialects while plundering all those wonderful female parrots. A hundred years passed and I was tiring of the parrorate life. Another 158 years rolled by and I had traveled the world over on every conceivable ship with every conceivable crew. No longer did the cannons roar and there was nothing to plunder. Pirates were out of vogue except in the movies. I had a few small parts but most of it is fakery. In 1981, I believe, I was on the beach, hard aground in Annapolis, trying to swill my life away. I was sick and destitute. But I was still invincible. Someone found me on a chill morning and took me to a pet shop. Oh, I have seen a lot of those. I was not eating and my prized tail-feathers were gone. I just didn’t care. Clinging to my perch in fever I recalled the lone bearded pirate saying redemption would come and your natural life as a parrot would begin if and when you boarded a ship. The ship had to be square rigged, seagoing, complete with cannon. One with a captain who truly believed, studied maritime history, reenacted when he could, and lived the life of a modern day swashbuckler. Not a plastic pirate on a plastic weekend boat. It had to be a lifestyle. The ship had to be wood, with the captain living aboard full time. None of this shore nonsense remembering wooden ships and their crews rotting in port. Fate bowed and in walks Captain Horatio Sinbad and Lieutenant Brown. 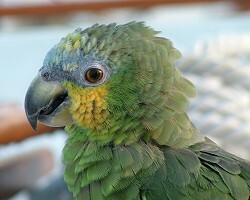 They were looking for a suitable parrot and went directly to the new beautiful birds with no brains and not knowing a gunport from a screen door. From their conversation I gathered they were off a sailing vessel and it didn’t matter to me, I had to put to sea again. I fluffed myself as best I could and began to move around boldly. The Lieutenant caught my bleary eye and she came over. A deal was struck and aboard the MEKA II I was home at last and began to survive. The rest is history. My heart gladdened and the curse was lifted. I am now a mortal Bartholomew Roberts, as a few incidents would tell. Maybe a future anecdote, perhaps. How much, she asked. She was told I could be had for little but he hated to take the doubloons because he thought I would be dead in a few days. Little did he know that I was invincible! Over the past 26 years that I have been aboard I have begun to age. My life should last another 25 years, about what the Captain’s should be, if we watch each other’s backs. The two other things I bespoke are still in place. I revealed these to the Captain while he was working on a book and captaining a freight boat in the Bahamas and they are that I could understand English and scribe and I still had the power of the Black Spot to use if he so chose.